I remember receiving this magazine back in the 1970's when I was just a kid! It was a blessing to peruse then, and it has come a long, long way since then. It often has both simple, easy to complete projects for the beginner, as well as more complex projects that utilize the latest of crochet techniques for the seasoned crocheter. I highly recommend getting a subscription for anyone who has the slightest interest in learning to crochet. Each issue contains a wide variety of projects that are tastefully photographed, making it safe for the youngest readers, yet still inspiring for those seeking a new crochet challenge. I don't just say this because I am blessed to be a contributing designer, but because I've been a genuine fan of this publication for almost 40 years! 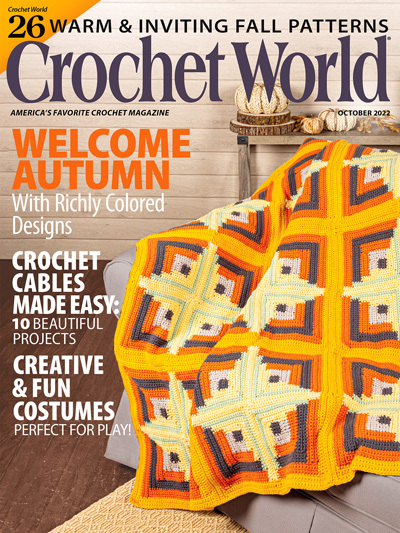 You can check out Crochet World by clicking the box below.